Wha-hoo! I made it! I’ll put up my grad photo soon ; ) My last exam went okay (not super-great, but fine) and I even managed to get an A+ on the last paper that I got back. It’s awhile until convocation (it’s June 20 for me) so there’ll be a wait for the piece of paper and cap-and-gown photo, but still. It’s all done. And what did I do after? Go to the store, hang out for a bit, then go over to the boyfriend’s and have dinner and catch up on Grey’s. Not that exciting, but nice. And then the fabulous Joyce had a birthday party on Saturday night, which was the realy partying night (partied a little too hard). Today I woke up late, had lunch (yep), went to check out the soon-to-be-mine allotment garden plot and then for a bike ride. Out for early mother’s day dinner, since my mom will be out of town next weekend. A few hours spinning and catching up on taped shows, and here I am – ready to unleash some backlogged photos of things. 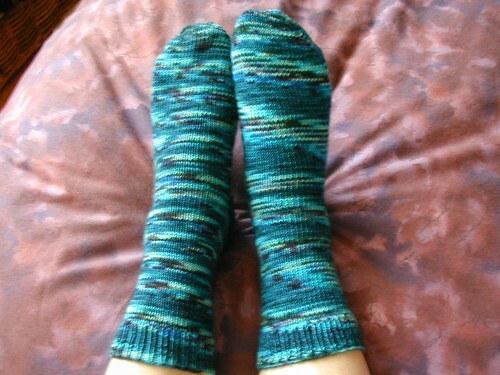 Finally finished – a pair of Jitterbug socks. 60 sts on Knitpicks US 0 circs, top down with a short row heel. 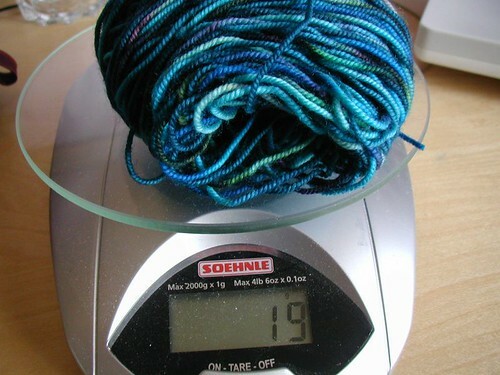 Oddly, the socks themselves weighed 89 g – so I had 108 g of yarn! Maybe I should start a leftover sock yarn blanket soon. STR in Farmhouse. I started these socks at the Frolic, and then proceeded to leave my go knit pouch and the sock behind when we left! I called the next day, and luckily they’d put it in the lost and found for me. It definitely wasn’t the worst thing I could’ve left, but I was very glad to get it back nonetheless – it’s working up really nicely. Now? There’s so much crafting (and gardening) to be done! I’ve got a near-FO and a bunch of other random in-progress stuff, but I think it’s time I cast on for something celebratory. Guesses? Congratulations! More time for knitting . . . Congrats!! And the socks look lovely! Congrats on finishing school! I’m sure it’ll take a bit for the freedom to sink in. Congratulations on finishing school! This idea of a “celebratory knit” is a wonderful (but dangerous – for my bulging knitting basket) one. Congrats! School’s out for the summer, eh? And that’s a really lovely STR colourway. Congratulations! Hmm…a celebratory knit? I don’t have a guess, but I love the concept! Congratulations! Best feeling in the world, that I’m finished with college one. Yay! con-“grads”! and i love the color of the Farmhouse socks – glad you were able to recover them! 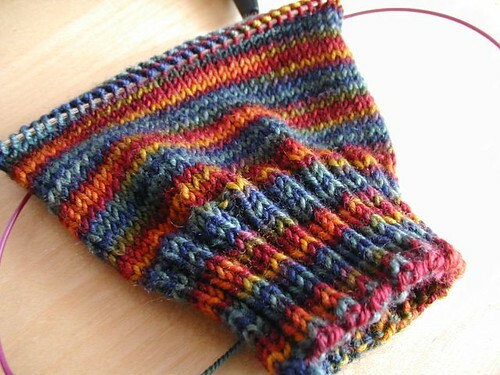 Pretty, pretty socks (Jitterbug). I’m knitting a pair of socks now with it and I really like it. Congrats on finishing! Congratulations! And lovely socks, that jitterbug looks great. Congratulations! It must feel absolutely, deliciously relaxing to have finished. And could it be that your smashing design with the rayon/metallic yarn would be appropriately celebratory (and summery?)? Hey, congratulations! That’s wonderful! And if you don’t want to celebrate with calories, I recommend a high-fiber diet instead. Is that ball of Jitterbug the Jay colorway? I’m knitting a pair of socks with it right now and I’m having issues of pooling, but your socks look fantastic. From one student to another, congratulations on graduating! Congratulations!! Doesn’t it feel so great to be done!!?? And I’m happy to know about the Jitterbug — I was concerned it was a little short. Congratulations! Very jealous of your allotment garden plot – I’m looking forward to seeing photos of what you do with it.